Kingston® ValueRAM® is purchased by customers who know the exact technical specifications of the memory they need. 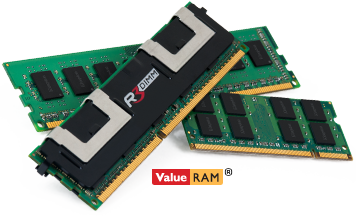 ValueRAM memory is fully compliant with JEDEC Specifications and is 100-percent tested and backed by a lifetime warranty. JEDEC sets the standards for semiconductor engineering and is the semiconductor standardization body of the Electronic Industries Alliance (EIA). Approximately 300 companies representing every segment of the industry actively participate to develop standards to meet the industry needs. As a long-time member of the JEDEC Board of Directors, Kingston Technology helps set the industry standards for memory technology. All Kingston memory is fully JEDEC compliant, an important specification used by leading semiconductor manufacturers. Take a virtual tour of Kingston’s manufacturing floor to see how DRAM memory modules are made.